Today’s adventure into the musical past of the University of Virginia comes courtesy of my sense of curiosity. 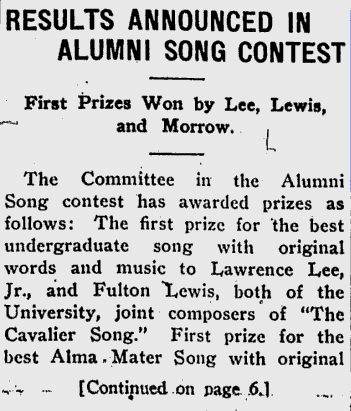 I had often seen the statement (starting with Virginius Dabney’s fine history of the University, Mr. Jefferson’s University) that “Virginia, Hail, All Hail” and “The Cavalier Song” were winners of a competition sponsored by the student newspaper, College Topics, for the best fight song and alma mater song. It occurred to me that I had repeated that claim in several places, including on Wikipedia, without actually checking the primary source. I had a little downtime on Saturday and paged through copies of College Topics from early 1923—thanks, Google. What I found surprised and amused me a little. So apparently, even in this more musical time, students and alumni were not pounding down the door to provide original songs. 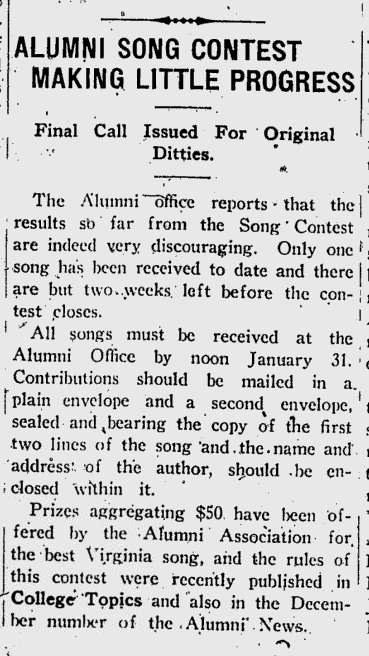 Discovery two: The competition was not specifically to find an alma mater song or fight song; it was more generally about getting more original songs written about the University and was open to both students and alumni. Discovery three: The organizers weren’t wild about the winners! On February 16, in announcing the winners, they said the following: “The Committee desires to thank those who submitted songs and to congratulate the winners. 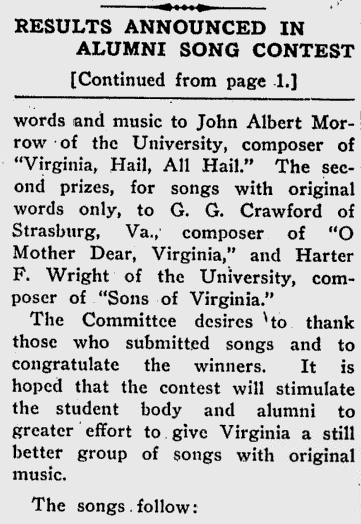 It is hoped that the contest will stimulate the student body and alumni to greater effort to give Virginia a still better group of songs with original music.” This attitude may explain why “Virginia, Hail” was not more widely adopted outside the Glee Club. Also of note: neither of the second place winners were Glee Club members, while two of the three first place winners were associated with the Club. I still have one more piece of research to perform, since I haven’t seen the original announcement of the competition. Google News archives doesn’t have College Topics from December 1922, and I can’t find a copy of the December 1922 Alumni News on line either. But I’m a little closer to having good information than I was.